When I think of embellishments, I think of jewelry, or bling. That is the most common form of embellishing, oneself or one’s clothing. 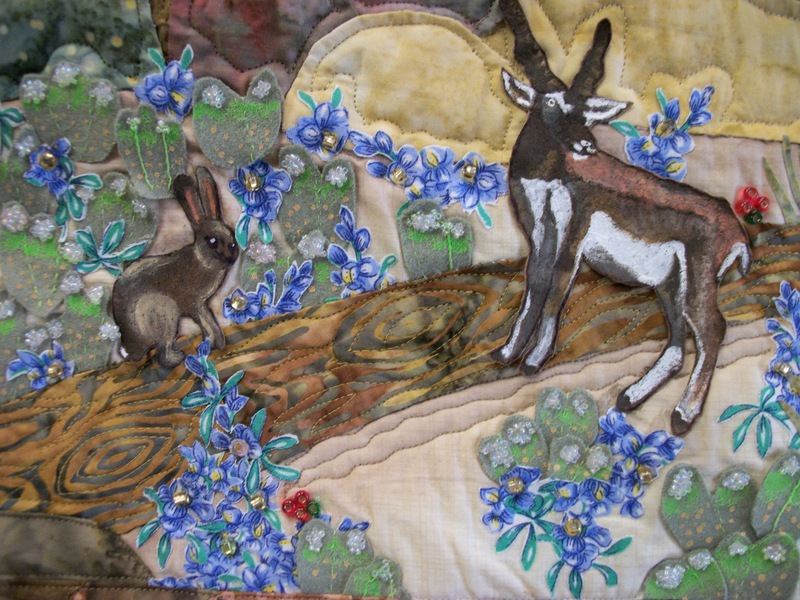 Just about anything can be embellished, and in the world of quilts, oftentimes art quilts are the most heavily embellished. 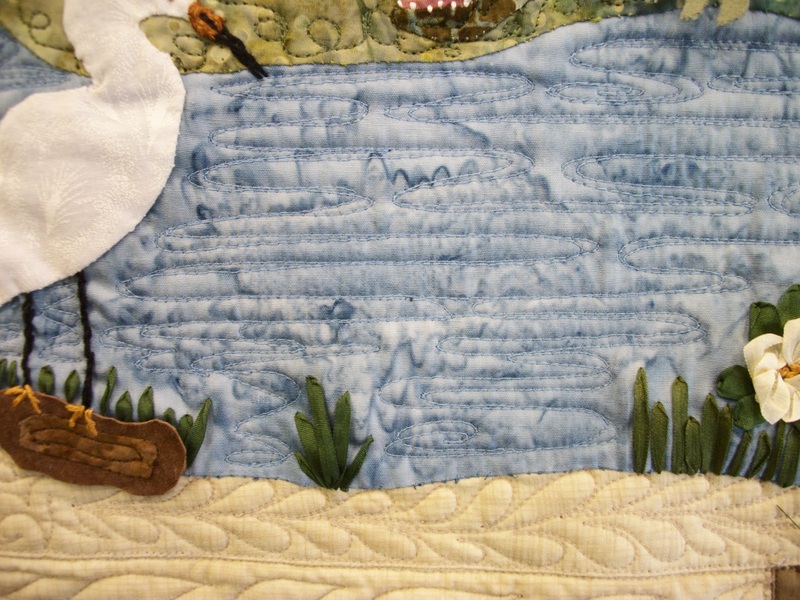 Quiltmakers often adorn their quilts with applique, embroidery or cross-stitching. 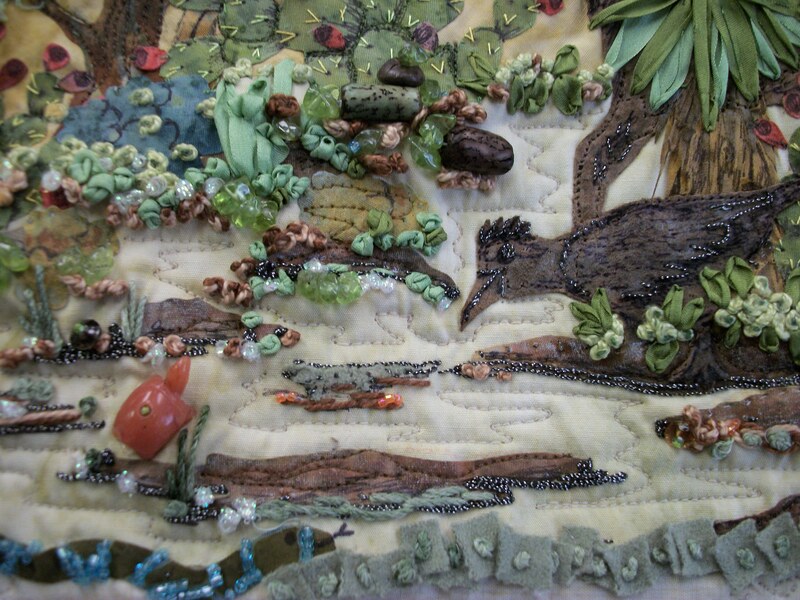 Sometimes you will even see buttons, ribbon, beads, twine and other creative additions, especially on smaller, art quilts. 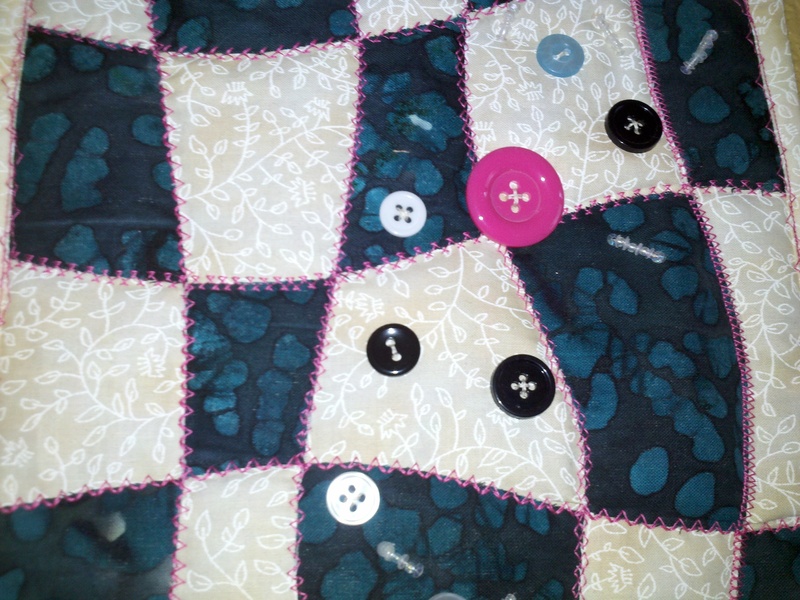 I’ve thought extensively about embellishing my quilts, but what holds me from it is that I generally make larger quilts that are warm and snuggly, or baby quilts for the crib. I don’t think adding something small and hard would make those quilts better. 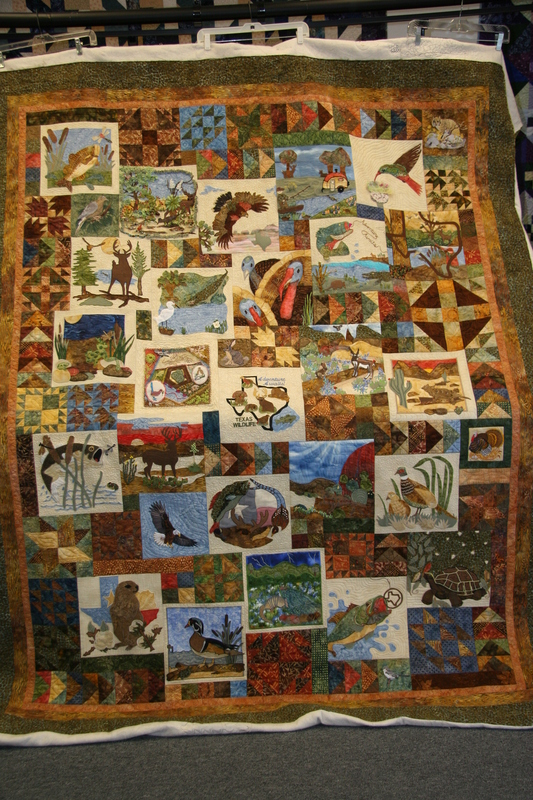 Although, large quilts can certainly be embellished. 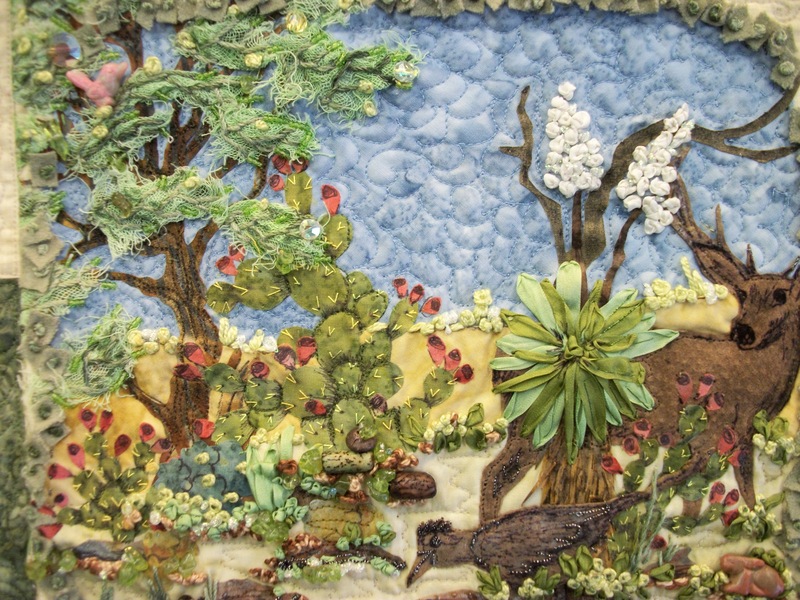 This was the Texas Department of Agriculture State Fair Quilt that was created from many individual block submissions by quilt makers. 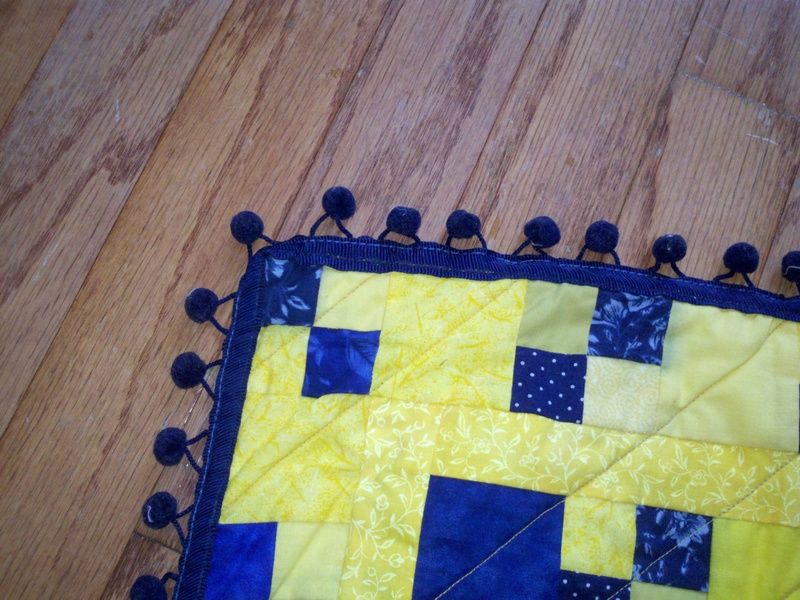 I added tassle-like acorns to the ends of a few table runners once, which completed the look. 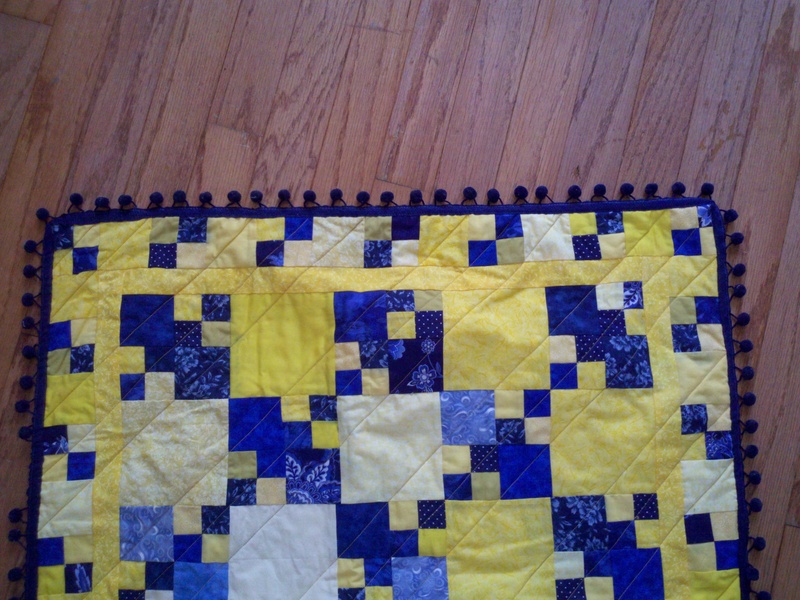 I did embellish one small quilt with an interesting binding. Pictured below, this pattern is called lemonade, and I made it in a miniature size, perfect as a table topper. 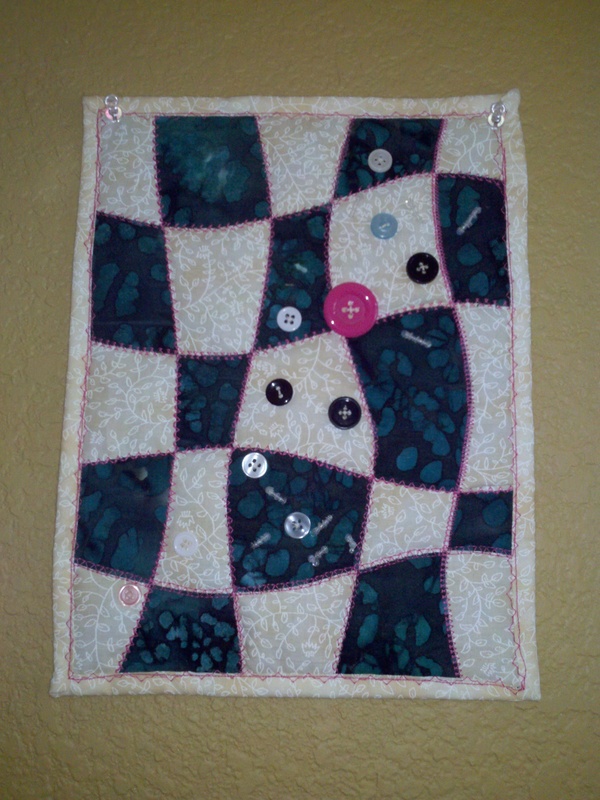 The other embellishment I did was on a mini wall hanging. The purpose of this quilt was solely visual pleasure, and I made it during a class on quilt weaving (I can expand on that later). I named it “Button Explosion”. 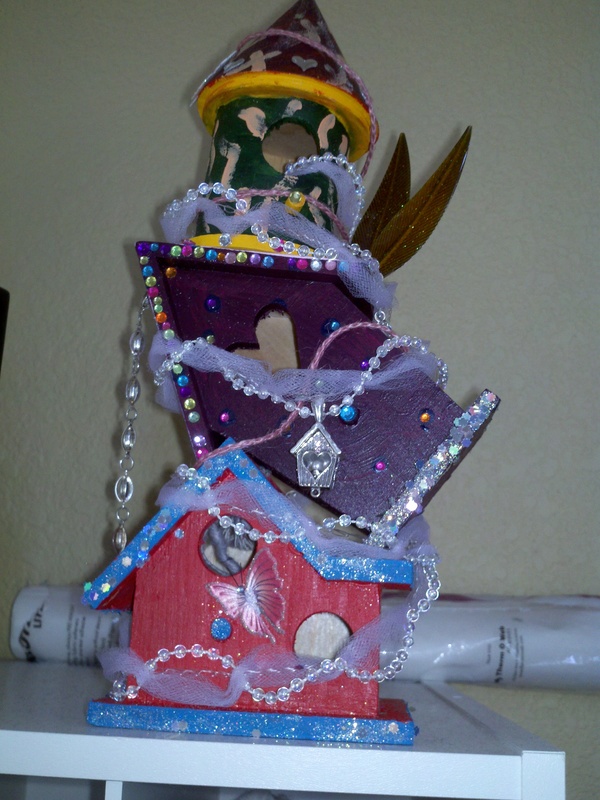 I did embellish these birdhouses like crazy, but I felt they needed it to become what I had imagined. 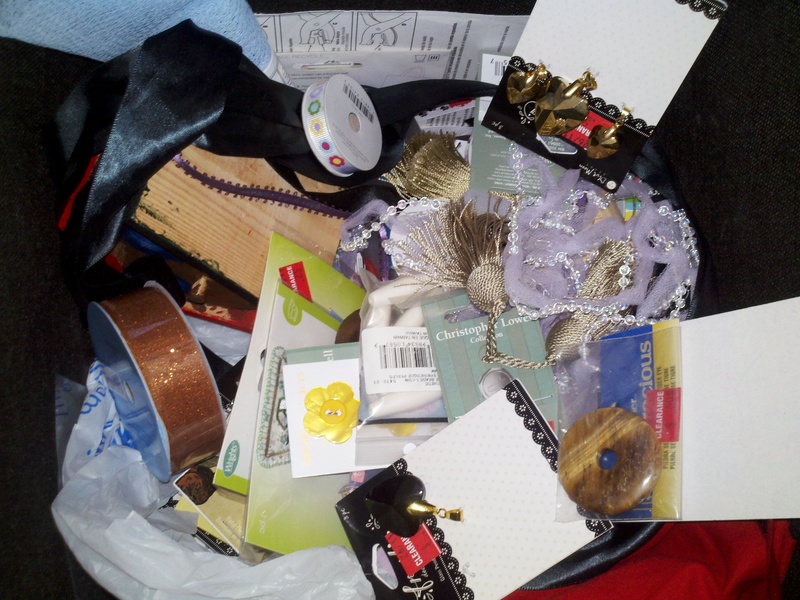 This is a picture of my embellishments bin. You can see a number of clearance tags in there, because I usually build this inventory through clearance sales at local craft shops. I buy what jewelry, charms, stones, ribbon, patches, buttons, etc. that look interesting to me and just throw them in the box. 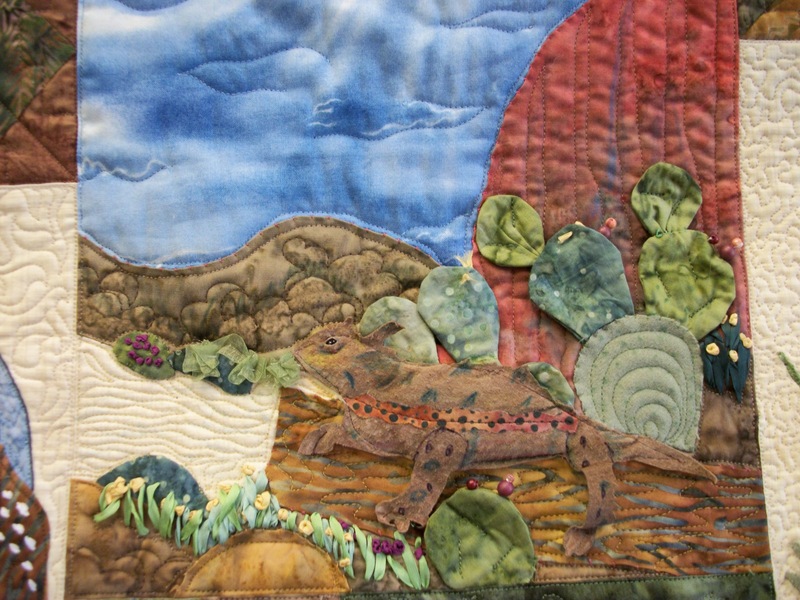 I think I just need to make the leap, and create a smaller, smaller-scale quilt that is meant to be hung on the wall and embellished to create a total artwork. NOTE TO QUILT MAKERS: if you do intend to embellish your quilt, PLEASE PLEASE PLEASE do so AFTER the longarm quilting has been completed. Otherwise you risk having some beads that need reattachment. Thank you for perusing my friends! Happy creating! !